Schenectady, N.Y. — Metroplex and Sequence Development today announced that the Clinton Street Mercantile has signed a lease to occupy more than 4,500 square feet of ground floor retail space at 144 Clinton Street in Downtown Schenectady. The new retail concept will be operated by Brandon and Michelle Whittall of Ballston Spa. The building, located just a block from Proctors and many other downtown attractions, will feature up to twenty smaller retailers sharing space similar to the co-working trend in the office market and shared space for food vendors such as the Troy Kitchen. Brandon and Michelle Whittall said, “We believe strongly in the concept, the location, the building, and the team. It has the potential to be a great resource for so many potential entrepreneurs in the Capital District.” The Whittalls will open the first retail store at the Clinton Street Mercantile called Uniquely Yours. 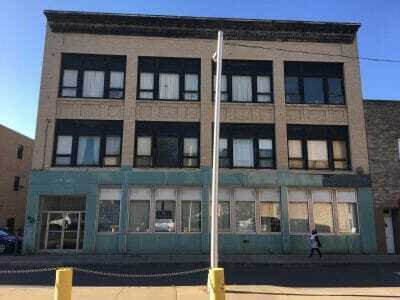 The Schenectady County Metroplex Development Authority is providing a $75,000 grant to improve the façade of the building. The three story building at 144 Clinton Street was constructed in 1913 and served as an office building, business school, bowling alley and even as the home for city government while city hall was constructed in 1931. For many years, the building was headquarters for Ter Bush and Powell, a large insurance agency. A “ghost sign” for the insurance firm is on the building and will be preserved as part of the renovation plan. A $2 million renovation of the building includes plans for 12 apartments on the two upper floors and the new Clinton Street Mercantile on the first floor. Work is expected to begin in September. Sequence Development recently completed the $7 million renovation of the Foster building complex on State Street just a block from Clinton Street. The Foster building is now fully occupied by 22 apartments, 8,000 square feet of office space, two restaurants and two retailers. The developer is also restoring 514 State Street and has signed a lease with a retailer for the ground floor.